It was absolutely freezing in the North East last week with the arrival of an arctic Winter blast - I'm talking snow, ice, rain and wind so strong it knocks you off your feet. Yuk! When weather like this arrives, getting ready in the morning suddenly becomes a bit of a mission for me, as my commute to work involves pounding the pavements rather than snuggling in the warmth on public transport. I do around an hours walking to and from the office every day and getting myself there in one piece can be a bit difficult when my feet are slipping along icy pavements and my hairstyle is getting ruined by sudden gusts of wind. One morning last week, I caught a look at myself in the mirror before leaving the flat and realised how ridiculous I looked. Dressed head to toe in boring dark waterproof gear, I looked more like I was heading out to walk the dog than going to the office. 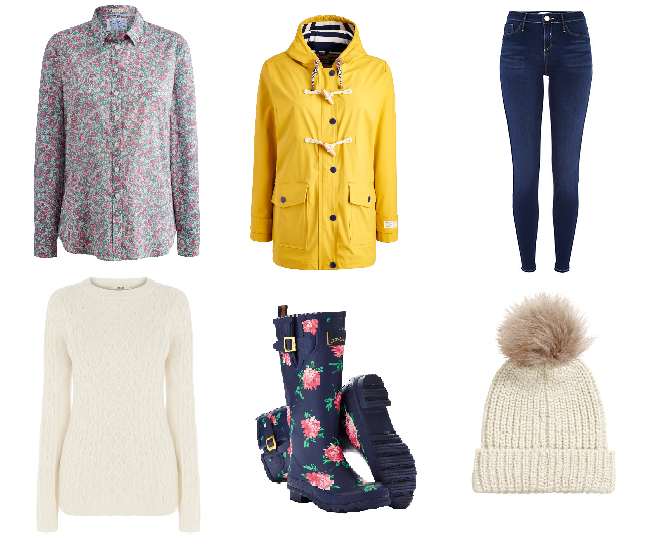 So I've decided my Winter wardrobe needs a bit of an overhaul and I need a few pieces that are practical for the elements yet colourful and stylish. We all know the key to successfully dressing for Winter is layers. It may be cold outside but it can be roasting hot indoors so I need an outfit that can work in any temperature. My favourite way to layer in the Winter is to start an outfit with a long sleeved shirt. They are fantastic under jumpers to add some extra warmth but still look great on their own if temperatures start to rise. 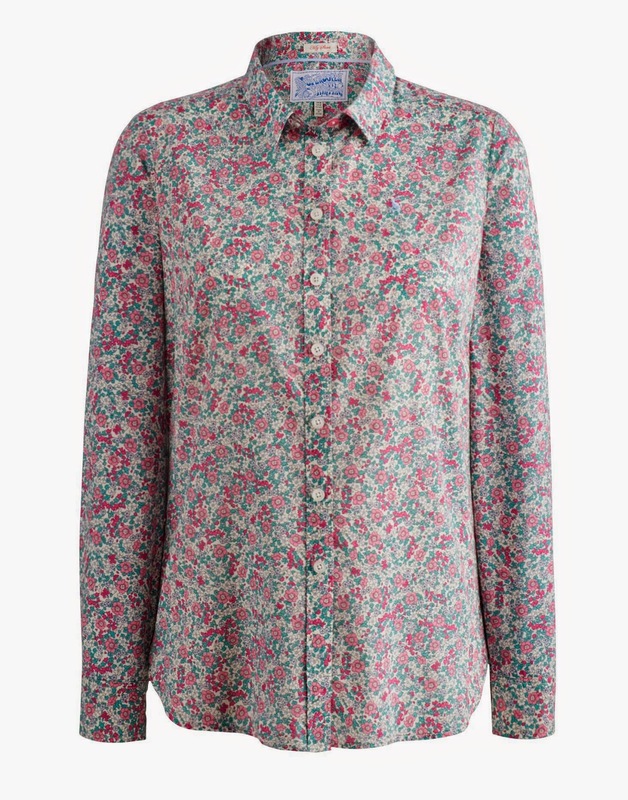 I currently own some rather dull looking shirts so I'm after something with a bit more pizazz like this flowery shirt from Joules. Joules have some gorgeous patterned shirts and seeing a beautiful flowery collar peeping out underneath my jumper would be a great way to jazz up any Winter outfit. I'm particularly interested in this shirt as the pinks and greens also make it appropriate for Spring and I think it'd look really cute with a pair of white jeans in the Summer. 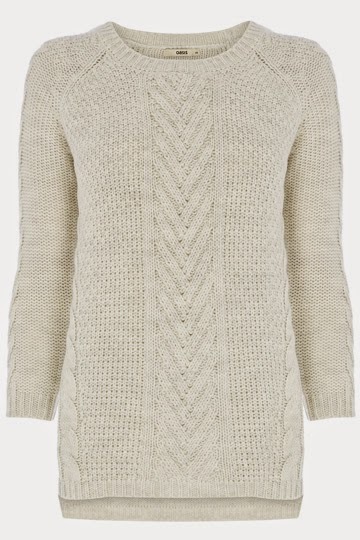 I'm a bit partial to a cable knit jumper so next on my shopping list is a lovely chunky jumper to sit over my shirt. I tend to like my Winter jumpers big and baggy to hide those few extra lbs I've gained over Christmas. This one from Oasis particularly takes my fancy. My go-to wardrobe item over the Winter tends to be skinny jeans, not very exciting I know but they are the best way to keep your legs warm against the biting wind. My favourites are the Molly jeggings from River Island, they're such a flattering fit and come in a wide range of colours. After years of falling over on icy pavements I finally realised that wearing wellie boots in Winter is the perfect way to keep me upright. I can happily stomp my way over any ice patches without falling over. My current wellies are boring so I've got my eye on something a little brighter to see me through the dark months. 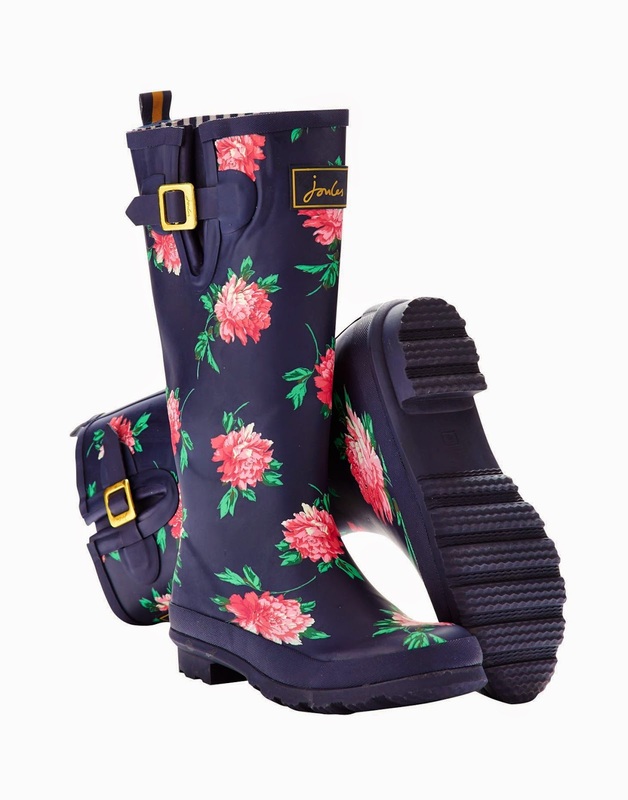 In my quest for eye catching wellies I've spotted these lovely floral print boots from Joules. 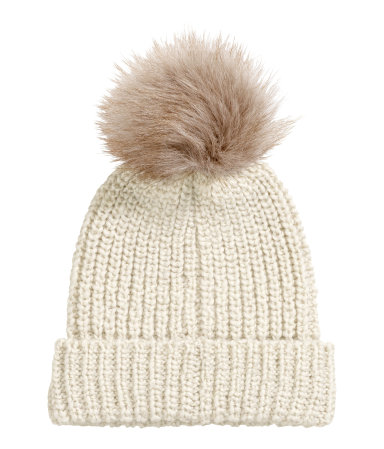 Of course no Winter outfit would be right without something to keep my head warm and H&M have a lovely selection of knitted hats complete with compulsory bobble. My collection of hats and gloves seems to be every growing but you can never have too many can you? It's only right to have one in every colour to match every possible outfit. Now for my current obsession! I know I've said before that Simon keeps trying to tell me I don't need anymore coats, however after I spotted this beauty in Joules I knew that I need just one more coat to complete my collection. 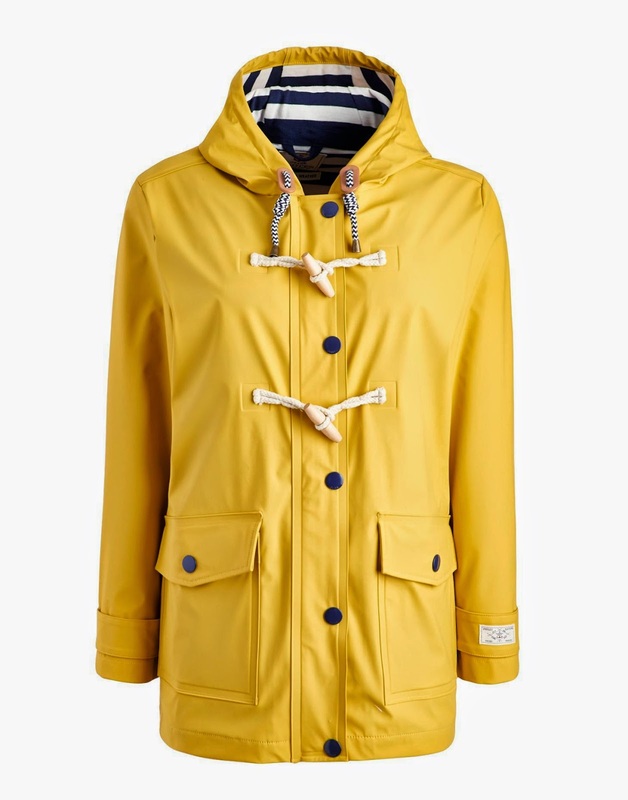 Joules have the best collection of raincoats in a variety of styles and colours and I have fallen madly in love with this sailor inspired yellow waterproof. I've tried it on and it looks amazing - it makes me want to splash about in puddles and go on coastal walks. It would definitely brighten up even the most miserable wet day. I'd love to know if you have any tips for battling the Winter elements in a fun way! This post has been written in collaboration with Joules. My only tip is layers, layers, layers. Layers! I love the cable jumper and that yellow raincoat is the stuff of dreams. Need me one of those. I love the yellow rain coat and the patterned blouse.